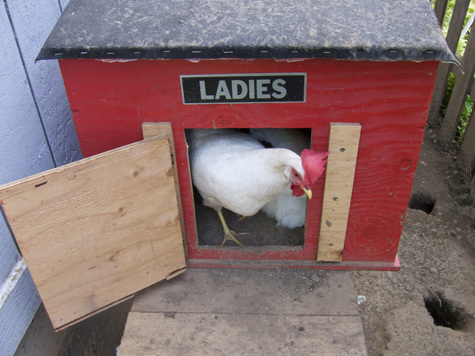 Petunia Blue guards the henhouse from evil invaders. Hello from HQ! It’s been a while since I’ve posted garden pictures, and this year’s tiny plot is finally taking off. These images are actually from a few weeks back, so there’s even more action now. We’ve had an exceptionally wet June and the extra moisture stunted some growth (tomatoes) while simultaneously stimulating others (gourds and greens). So it’s a mixed bag this year and who knows how it’ll all turn out . . . with my incredibly limited garden time, I’m just thrilled to be growing anything at all! Let’s start in the front yard. 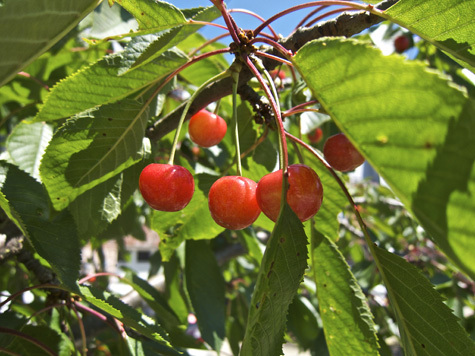 You may remember my cherry tree discovery from last year. Well, this year was even more bountiful! And recently Damian spent an afternoon high atop a ladder, harvesting . . .
We got maybe 6? Maybe 8? 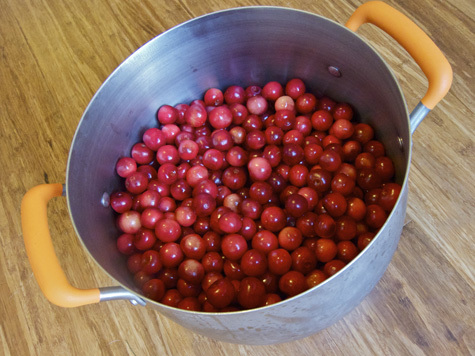 pounds of cherries. I can’t wait to show you what I did with them! Coming soon . . .
For reference, this was the layout as of mid-May, just a few weeks after planting. 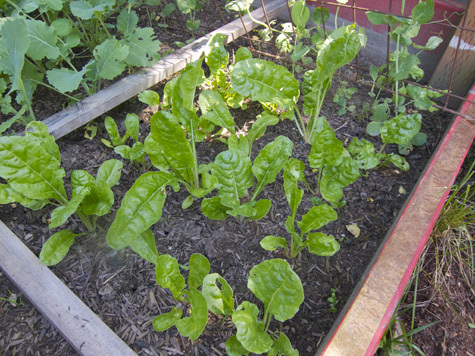 The beets (up top) and all the greens are flourishing. Kale blend: mostly Red Bohr, some Dino. The chard is so bright and beautiful. Thriving! Happy little chard. Grow baby Grow! 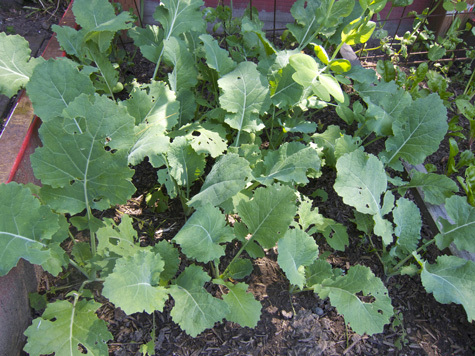 The collards . . . mmm . . . I can’t wait to make them into RAW summer wraps! To the far right of the bed (not pictured), strung up on an old box spring frame, are some sugar snap peas that I may have started too late. And on the other side of those (protected in their shade) are 6 little basil plants. Cross your fingers for these guys – I’m *really* hoping to preserve pesto this year. The lefthand bed is split between squashes and tomatoes. 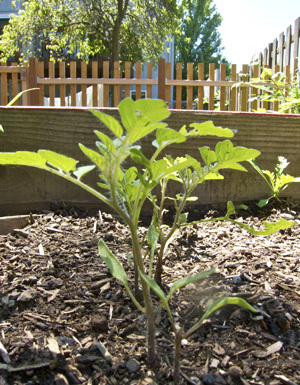 I started most of my tomatoes from seed sown directly into the ground. Not ideal, but I was busy with baby! The poor little guys damn near drowned in all the rain we’ve been having and they’re seriously stunted in growth. I don’t think any of the Goldens or the Green Zebras made it. 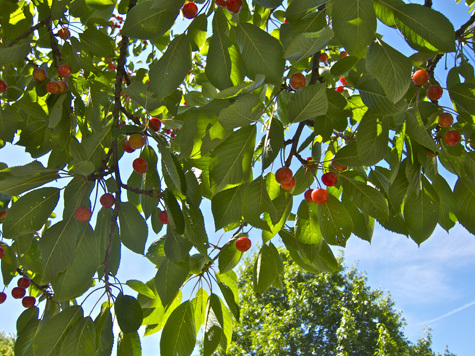 But the cherries and the reds are finally starting to take off! Precious cherry tomatoes that fed me so well last year, you can do it! I believe! 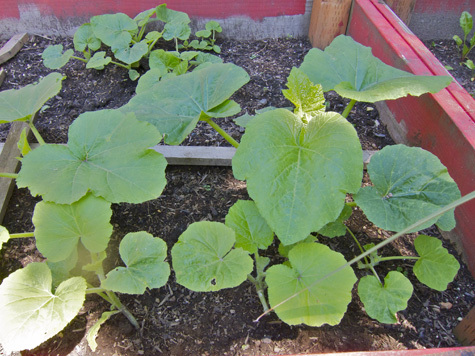 And the gourds are doing GREAT. I planted both pumpkin and acorn squash and got them in early enough for once. I expect I’ll be carving my homegrown goods this Hallowe’en! Pumpkins in the foreground, acorn squash behind, w00t! And of course beyond the boxes lies the strawberry/sunflower patch. My sunflowers were started from seed in the ground, but the made it! 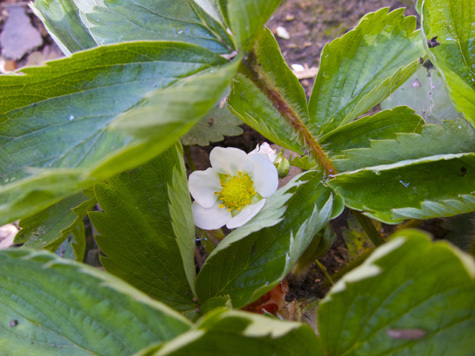 The strawberries have been demoted to mere slug deterrent. Waits gets gas when I eat them, and if I leave them on the bush they draw the slugs away from my greens. So, this veganic method is working well for us this year! You can also see in some of the other pictures, I’ve lined the beds with copper tape. This has been *excellent* for keeping slugs out of my goodies. Highly recommend! 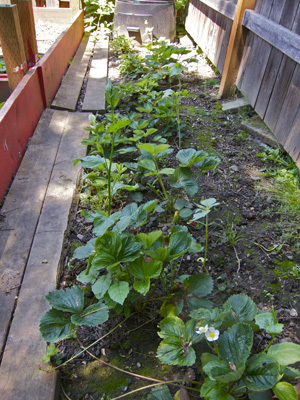 The strawberries and the sunflowers (with the compost in the background). And that’s the micro-farm! So what about you, my dears? How are your gardens growing?? May your garden grow well this year! beautiful garden!! love all the greenage :) yum! 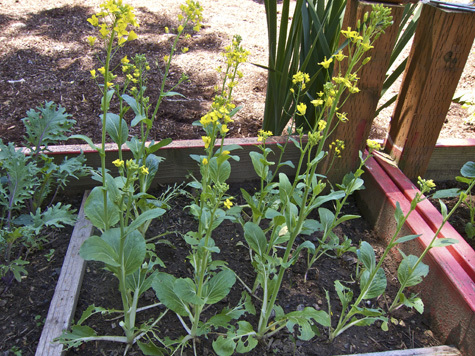 ours is doing well considering several hailstorms have ravaged some of the plants. but we just started harvesting some snap peas and the bell peppers are about ready, too. Micro!? compared to mine, its huge! Oh well… It's always nice to read about your garden. It makes me jealous (in a good way) of you. A question for you, if you don't mind-what do you do with your chickadees eggs? Hi everyone! Love hearing about all your gardens. 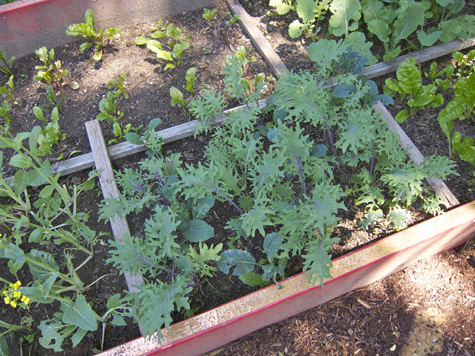 Feel free to include links if you have pictures or blog about what you grow. I’d love to see! @ Tenise Rae – Hey girl, it’s great to hear from you! I was wondering where you disappeared to – hope the move was smooth and life has settled down! http://youthfarmers.blogspot.com/ – - – this is the link to the farm. 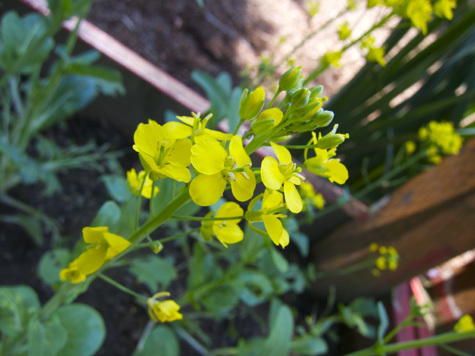 We’ve just uploaded all the photos so you’ll be able to see the farm go from abandoned weed patch to a real farm. 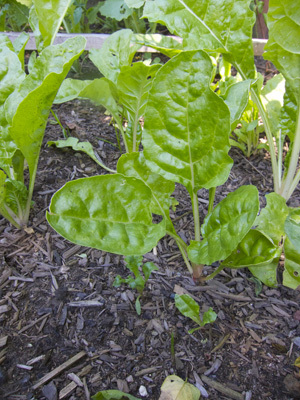 we just harvested some beets yesterday, and they are delicious! mine is doing alright not really producing much i have some red bell peppers coming on and my tomatoes seem to be doing much better now.. unfortunately i am very sad to say my little chicken shelldon who i bought back in april at a chili festival was gotten by one of my nieghbors dogs and is no more. i was so sad and thekids cried but i can’t do anything about it now. :( trying to think positively about it.. we’ll be getting some new chicks soon as my hubby makes a good chicken coop for them. other than that garden is doing good beans are up tomatoes and peppers are growing basil and anise came up (really excited about anise) and squash is finally blooming. Your garden is AWESOME! 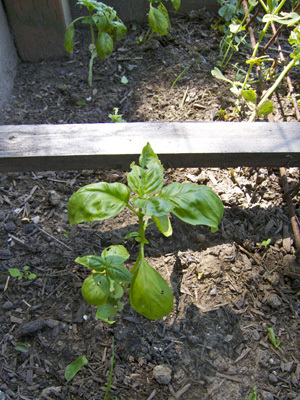 I was surprised to read about your basil being protected by the shade… I always thought basil loved sun. 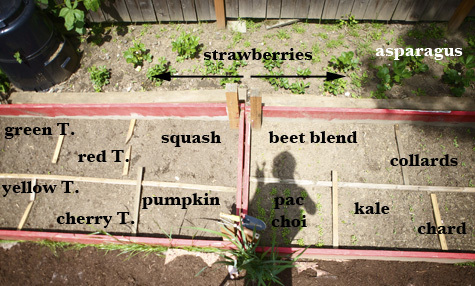 @ Youth Farmer Mia – Awesome, looks great! Did you guys end up doing potato tires? @ Meghan – I know right?? But every year I kill basil, death by sunlight. I figured this year I’d try something different, and so far it’s working. We’ll see . . .
i’ll look into it.. the only problem is here in oklahoma people are more likely to eat a problem chicken than to give it away/sell it and there are sooooo many chicken breeders its crazy i dont like the way they keep them but i don’t know if i have any choice reallyif i want a chicken. not around here anyway.. but i have seen a few yards with chickens everywhere i might get up the courage to ask them..
We haven’t done nearly as much work in the garden as I’d hoped, but we had good luck with snap peas, and the pole beans are coming along. Sayward dear — first of all, is that your REAL name? Second of all, I love you already and I just happened upon your site this morning when I was seeking a way to unclog my tub drain in an earth-friendly way. Now that I’ve found you, I’d like to keep in touch . . . thought I would share a photo of my sideyard which is my urban farm called Beth’s Yarden (you’ll have to tell me how to get it to you). Thank you for inspiring me to keep going with my yearn to live in harmony with our beautiful home, Mother Earth. 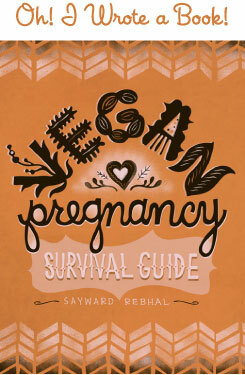 @ Beth DeLashmutt-Poore – Haha, yes, Sayward is my given name! If I were to name myself it would be something much feistier, like Moxie Anonymous! So glad you like the site! Welcome! Can you post a link to a picture? Feisty, Moxie, Say . . . whatever your name shall be called . . . post a link to my pics? Now that would mean I’d have to have a website or a blog and actually be putting myself out there to the world, yes? Not to mix technology inquiry with the natural world but is that how I would have to share my pics with you? (Ooops, Beth, your age is showing . . . ) Thanks for the insight! @ Beth DeLashmutt-Poore – Yup, alas I think that would be the only way. Sorry! Thanks so much for the inspiration! 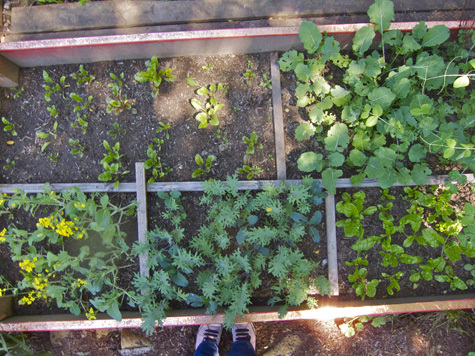 I’m gonna get my piece of land soon =D and gonna get lots of yummy veggies growing!